"Covered Call: Buy stock, sell options. Net returns." 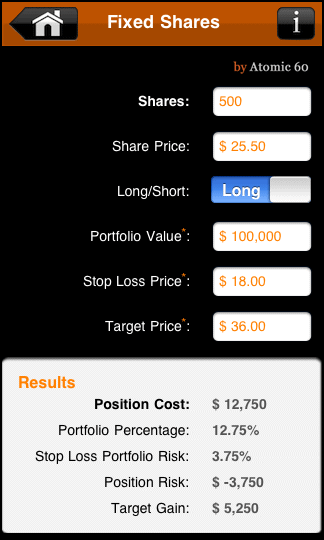 Buy Stock shares and Sell equal number of option Call contracts. The Covered Call calculator takes all commissions into count giving you a true Net return. ITM: In the money. This refers to an option having a positive intrinsic value. OTM: Out the money. Meaning the option has no intrinsic value and will have no value at expiration. You do however still keep the proceeds from selling the original Call. I own 300 shares of ABC stock at $50.00 per share. I think the stock will move to $60 within days. I sell 3 call options at $60 strike price for $4.50. This nets me $1,340. If the stock closes above $60, I will net $4,333 which includes the premium I received plus the growth in value from the stock moving from $50 to $60. This results in a 31% return on my trade. If the stock does not reach $60, I still keep the $1,340 premium and keep my stocks which in turn lowers my stock ownership price from $50 to $45.55. Not bad.